As most know, I'm a proud owner of the Sony Alpha A700 DSLR. It's a great camera for a variety of subject matter and shooting styles. Over the past few years, I've come to love this camera, as it is, in my mind, unsurpassed in ergonomics and versatility for the price. No, it doesn't have an articulated LCD display, no live view, no full frame sensor, no mirrorless optical path, and no HD video. It is a camera. Digital, but a camera all the same. Those wanting to get information now, I can't recommend the following sites enough, when it comes to Sony cameras. Great resource for folks wanting to learn more about any Minolta/Sony camera with the Alpha mount. 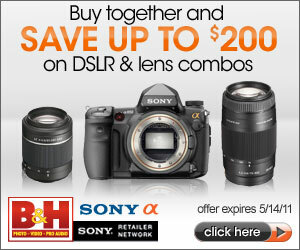 He also has some awesome ebooks on Sony Alpha DSLR cameras.